The diagram above uses JFLAP - where the symbol $Z$ reflects the empty stack. The symbol $λ$ is the empty symbol $ϵ$. It accepts everything as it should, but I don't know how to let epsilon get through. q7 to q8 is when there is more b than a. 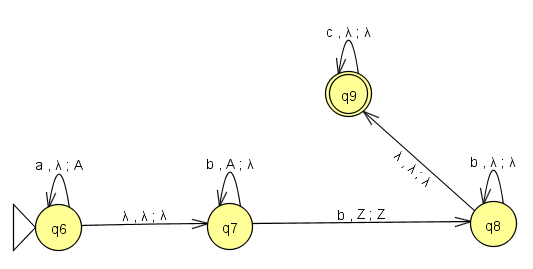 So there should be a way to allow q7 to q9 where a is more than b but also epsilon can get through. Thoughts? I would like to simply set epsilon through but than aabbc can get through easily enough. The only case where you want to accept $\epsilon$ is when you haven't had any other input and your stack is empty. Therefore you need an accepting state right at the beginning. How do you obtain transition relation of a PDA? Are all PDA equivalent to two-state-PDA? Is Acceptance by Empty stack and Final state possible in the same PDA? Are there strings which get accepted only by PDA by empty stack and not by PDA by final state, and vice versa?